Also available half price on MP3. 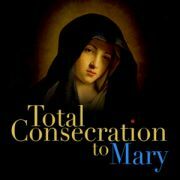 This five-piece album contains a series of successive one-hour conferences on St. Louis de Montfort’s masterpiece, True Devotion to Mary. Brother André Marie gave these talks to an audience who, for the most part, were preparing for making the “Total Consecration to Mary” according to the progressive schema of the great Marian apostle. Having many times given similar courses of conferences to prepare people for the total consecration, he parted from his usual program this time to introduce considerations on the spiritual life drawn from masters such as Blessed Columba Marmion, O.S.B. and Father Reginald Garrigou-Lagrange, O.P. These are placed into a framework fixed by Saint Louis Marie de Montfort’s schema of four preparatory intervals divided into thirty-three days. It may be said that the net result is a synthesis of Saint Louis de Montfort with these spiritual masters, one in which heavy emphasis is placed on explaining the Blessed Virgin’s role in the economy of salvation. In February and March of 2008, Brother André Marie gave a series of five conferences on Marian Consecration. Having many times given similar courses of conferences to prepare people for the total consecration, he parted from his usual program this time to introduce considerations on the spiritual life drawn from masters such as Blessed Columba Marmion, O.S.B. and Father Reginald Garrigou-Lagrange, O.P. These are placed into a framework fixed by Saint Louis Marie de Montfort’s schema of four preparatory intervals divided into thirty-three days. It may be said that the net result is a synthesis of Saint Louis de Montfort with these spiritual masters, one in which heavy emphasis is placed on explaining the Blessed Virgin’s role in the economy of salvation. God has commissioned her, as Mediatrix of All Graces, with a quasi-infinite power, especially in these latter times, to gather the elect, her children, under her mantle, and preserve them in grace even as she increases their capacity for more grace, so that they will be more conformed to the image of her Son, Jesus Christ. As a member of the Order of the Slaves of the Immaculate Heart of Mary, Brother André Marie knows the value of this consecration, and the comforting security that it offers to those who live it well.